Michael Kyte was important in the East Side planning, and in fact came up with the name “CETIP” (City and East Side Transit Improvement Program). I distinctly recall the conversation. He is, or was until recently, teaching engineering at University of Idaho, Moscow. Also, an early and typically vociferous advocate for a Portland city grid was Jim Howell – first as an outsider citizen, but later as staff. It was he and Don MacDonald who introduced the crucial notion of multi-destinational connectivity with the Westside timed transfer network changes in, what, 1979? That really set things in motion. Jim is still there in Portland. MacDonald brought the concept from Edmonton, where it had been imported from the Netherlands by Dr. John Bakker of the University of Alberta … the spread of the bacillus as we put it. The suburban timed transfer system, introduced [in 1979] at the behest of Westside employers who wanted local access for their employees, not just an express to Downtown, was a big success, and demonstrated that the non-Downtown market could be served in the Portland environment. We even had an APTA-supported timed transfer conference in Portland later – 1984 maybe? I remember tending bar with GB Arrington at the opening reception. You may want to mention the context of the changes – that, as the excerpt from Thompson notes, they were the first in a two-step process intended to provide first rate “big city” quality connections to the Banfield LRT [MAX] line, then under construction, as well as a major boost to local travel possibilities in the city. The Banfield project made it politically possible to undertake structural network changes that probably should have been made anyway, but which would have been harder if not for the rail commitment. Step 2, undertaken on the first day of revenue rail service, was a truly gutsy move – completely unrecognized by the industry, but essential to the Banfield’s success. Abandoning the 17 and 44 expresses [which ran on the freeway alongside the new light rail alignment but branched off to various residential areas] on day one of light rail service – ah, that gave new meaning to the term “professional satisfaction. [Meanwhile, San Francisco] MUNI had adopted, and was at that moment in the midst of implementing in stages, a radical restructuring, 10-35 years overdue, of its network to provide enhanced local circulation possibilities as well as connectivity to and from BART and MUNI Metro. Peter Straus, MUNI Planning Director, was staying with us that weekend, and I drafted him into helping pass out flyers at Interstate and Lombard on the first morning. In adopting the CETIP grid, Portland was very much in the swim of progressive network development. Thanks, Tom! It was an honor to be hanging around as a teenage intern in those days! I hope this post will get some thanking (and thinking) going even from folks who weren't born then, but who take for granted the mobile, multi-destinational Portland that you and your 1982 colleagues helped to forge. 17 Responses to portland: the grid is 30 years old … thank a planner! Interesting to see (as a Sonoma county resident) that Tom is working for SMART. I still remain skeptical of the project for various reasons but hope it will be successful. I just don’t see why they are building a train in the 21st century that isn’t electric (SEPTA seems more modern!… ok ok joking), and why it will only run during commuter hours (and as such, I will likely never use it). Reminds me of the time I got stuck at the Hall/Nimbus WES Station at 10:30am because I assumed that the train would be running to connect me to the MAX… oops, transit fail. I’m also still pissed that SMART did away with the promised parallel bike path since I think it was such a critical part of the project. So many cities on the line are within easy biking distance it seems stupid to axe it when the bike path had to be the cheapest part of the project (and would provide 24/7 access to moving between towns sustainably on a bike). It might be personal bias, but I feel like if I can’t use the SMART train (and I like public transit more than anyone I know), then who can? I live in Santa Rosa and work in Petaluma but the train stops are nowhere near my house OR my workplace. And it only takes me 20 minutes driving down 101 and less than $2.50 a day in gas to drive. I’ve even biked to work which only took 1 hour. In Portland it was a no brainer to take the bus, MAX, or bike — but here in the North Bay, I’m just not so sure. I’m about to leave for a trip to Europe — first time — and it will be interesting to compare how they do transit over there. I can’t wait. That 1970 map is fascinating. This is gonna keep me busy for longer than it should. Ah, but anyway. Thanks, youze guys! Some of Helsinki’s bus lines were recently reorganized along similar principles. They started to run on their new routes a couple of weeks ago. The change from the previous system is on a much smaller scale compared to Portland, but nonetheless, a group of residents’ organizations from the different districts have sued the city for allegedly ignoring citizen participation principles in the change. This sort of thing seems to be inevitable, even when the districts in question still have a very high level of service after the change (some have multiple tram lines running at 5-10 minute headways). The city did not do a great job of communicating the big ideas behind the change, i.e. formation of frequent-service trunk lines and improving speeds, or even making sure that all the passenger information was up to date on the first day (the signage on some bus and tram stops is still being sorted out two weeks later). It’s very interesting to see what changed and what’s still around. For example, there’s still service up 24th/Regents/27th (the 9-soon-to-be-17) even though (aside from Regents) that’s not a very sensible route IMO. I don’t know how many change rounds there have been, but some of today’s service, although different, looks like it came almost directly from an adaptation of that map — for example, it looks like the 24 – Sandy/Prescott was repurposed to become the 24 – Fremont (similar elevation if you average it out), while the 12 was repurposed to Sandy (likewise). I still think the eastside grid could use some serious improvement — for any mode, moving north and south through the inner east side efficiently can be a challenge, but it’s by far the hardest on TriMet unless you happen to want the 75. (The 6 is also okay but terminates its N/S at Hawthorne.) The new 70 will help, but still won’t be that great. I notice that Portland’s 1970 map did a good job of neatly straightening out the grid streets, without any loss of legibility, and kept information to the minimum necessary; only being complicated because of the network – It’s a shame that what could have been a very simple, legible map following the 1982 changes was made much more fussy and complicated. Regarding the restoration of frequent service, it’s notable that now a lot of routes are pegged at every 20 minutes all day; some originally part of the frequent network and some not; while a few routes get very close to a 10-minute all day frequency. It seems that one option for moving forward (in line with arguments I’ve made here for a hierarchy of frequent services – http://nqrw.tumblr.com/post/20117185735/ ) would be to better publicise the important network of routes at a 20 minute frequency, and push as many routes as possible to every 10. The 10-minute network would not only stand out by the the clear priority for improvements such as transit lanes, signal priority and off-board fare payment. Excellent article and example of the benefits of grids. It also made me realize that the suburban grid system in Toronto will be 50 years old next September. I believe that the implementation of the grid was the start of the growth in transit usage in the suburbs. 1) Free connections (transfers for the non followers of Jarrett) between all types of service; bus, street car and subway. 2) The provision at many many stations of fare control areas so that the surface vehicles enter the station and one can change vehicles without passing through another fare check. 3) Interconnectivity,every surface route but one makes at least one connection with a rapid transit line. 4) Frequent service on many of the routes. Following Jason McHuff’s comment (#6 above), yes, many of the bus routes follow the Rose City Transit bus routes (the pre-1969 routes, before Tri-Met was formed), and those routes in turn followed the streetcar routes because Rose City used to operate the streetcars. As it closed streetcar lines it replaced them with bus service along the same route. Jarrett, I think you’ll recall the odd diversion that the Vista Avenue bus made, in one direction only, up SW Ravensview Drive (for non-Portlanders, a quiet residential lane), partly because Vista has a turn at Buena Vista that a northbound bus can’t easily make, and partly because the Greenway streetcar to Council Crest used that bit of Ravensview as far back as 1904. Thanks – great article. Far, far away from Portland, in Perth, Western Australia, a local ‘MAX’ light rail concept has just been floated to the public. Our system is pretty radial in nature; cross city connections are something we could work on, and we could learn from Portland’s example. Great story; I think that I’ve already thanked these people at various times through the years, but should mention some obstacles that had to be overcome. 1. Rose City Transit Co., which created most of the 1970 route structure, actually was better planned than most of the declining transit systems of the post WWII era. That was until its last big service cutback in 1969, which became the base line for this article. Yes, it was mainly a radial system, but it made adjustments for new developments as they came along. And, it did have some crosstown lines, in an era where they were disappearing elsewhere. 2. The 1970 map was not the worst situation. It got even worse when the “Blue Buses” group of suburban carriers was taken over, but not really integrated, with more overlapping service resulting. At Oregon DOT in 1972-73, I tried to explain this waste to my superior, but was told not to raise a fuss because we needed to keep good relations with Tri-Met. Oregon’s governor appointed the Tri-Met Board, and a wise colleague told me that someday important people would discover how badly Tri-Met was set up. This happened sooner than we expected; the governor canned most of the Board as a result of weaknesses displayed in the ’73-74 Energy Crisis. 3. As early as 1973, citizens’ groups were trying to get crosstown routes established and Tri-Met staff and some Board members were trying to kill the idea. A colorful, retired Railway Express employee fought successfully to get what became Rte 77 established, in spite of flat out dirty tricks against it. Of course, this route mostly duplicated others, so it made much more sense when the network was reworked. 4. Another activist who became involved in this era was Ray Polani, vice-president of a locally headquartered savings & loan. Polani knew a lot about organizational issues and called me at my new position at Edmonton Transit to see if there was anyone in Canada who might be available to help break the management logjam at Tri-Met. I suggested D. L. MacDonald, who had been pushed into retirement by the friction created in building the first LRT line on time and on budget. Interestingly, another Portland activist who carried over from the fight against the 1958 discontinuance of the Portland Traction Interurban Division, Al Haij, had spoken at length with D.L. in the late 1960’s and tried to interest him in coming to Portland. There are numerous other Edmonton < => Portland linkes during that era, but it’s only fair. The Edmonton trolley coach network before WWII was based on Portland’s. I am glad to see Bob Rynerson’s tribute to some of the other folks who helped make the grid happen. 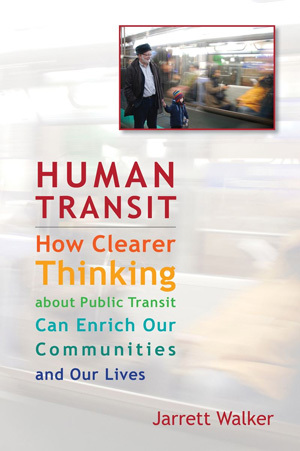 Ray Polani deserves particular credit for his collaboration with Jim Howell and other to form Citizens for Better Transit. Besides lobbying the “Tri-Met” board, CBT went around to neighborhood groups and others with a slide show explaining the merits of the grid system — softening up the opposition, so to speak. Ray is also largely responsible for bringing Tom Matoff to Portland, in addition to helping bring Don MacDonald to Portland. Ray also networked with other visionary planners around North America who provided the intellectual basis for the grid, timed transfer, and frequent trunk-line approaches to network design. After Oregon Governor Tom McCall left office, I heard him speak, referring to Ray Polani as a visionary, but someone who was often treated like the prophet without honor in his own countery. Grids for buses work when your road system is a grid. I notice that west of the Willamette, the grid breaks down completely. So this is more of a revolution for people *east* of the Willamette only. It looks like something could be done with the downtown grid (even though it’s in two pieces, at angles to each other)…. but I don’t think such a thing will be done. Perhaps the street grid is just severed in too many places. Of note, cities with nothing resembling a street grid (London, Paris) have had to take entirely different approaches to create full coverage. “Circle lines” become popular. In Vancouver, where the grid breaks down downtown, the approach is to bend the north-south buses downtown and then have them emerge on other routes on another side of downtown, or else have the West Side north-south buses go east on Broadway. The problems in downtown Vancouver are minor. Vancouver’s grid breaks down just before it hits the Burnaby border. Southeast Vancouver, Burnaby, and New Westminster have a spaghetti network and it’s completely unnecessary. Translink could use this kind of intervention with its suburban bus network. I was in with my daughter Portland for a wedding last summer and found the buses to be frequent and direct, we got all around town. The system was so straightforward that another tourist, not realizing we weren’t local, asked us for our help and my daughter was immediately able to direct her. help her. So yes, thanks, planners. Stay weird. Home › Connections, Transfers › Cuts › Frequent Networks › Legibility › Light Rail › Mobility › Pedestrians › Portland › Rail Transit › Strategic Transit Planning › Urban Structure › portland: the grid is 30 years old … thank a planner!